The Mom Standard: Patrick Stewart I'm Coming for You! Patrick Stewart I'm Coming for You! Beam me up Scottie, I'm going to Wizard World's Chicago Comic-Con August 11-14, 2011! Ok, so I'm sure I don't come off as a comic-con type but let me tell you I have not been this excited to step foot into a convention center in a long time. Gosh darn, I'm a closeted sci-fi junkie who still believes that Capt. Jean-Luc Picard was the best captain ever, comics are works of art, and Sci-fi trumps reality tv anyday! I'm taking the hubs and my daughter for Family Day. This is the day that kids and family can enjoy face painting, learning how to become a superhero, meeting animators of their favorite movies such as How To Train Your Dragon, entering costume contests, meeting their favorite superheroes (or villains), and much more. Plus, exclusive to Chicago, Wow! Wow! Wubbzy will be available for meet and greets! Here's the 411 on Wizard World's Chicago Comic Con. See you there! Share your love of comics, movies, and pop culture with the entire family when Chicago Comic Con hosts Kid's Day on Sunday, August 14, 2011. This is the day kids of all ages can enjoy activities such as entering the costume contest, getting their faces painted, making their own super costumes, learning how to draw and write their own comic books, taking pictures with their favorite superheroes, showing off their Padawan skills with balloon light sabers, and much more. All kid-friendly activities, vendors, booths, and sessions will be designated with a Kid-Friendly button. Kids can meet Wow! Wow! Wubbzy! in person and have their photos taken with him. Jarret Crippen, the Defuser and winner of Stan Lee’s Who Wants to be a Superhero?, will be hosting Kid's Day and holding a session for kids on how they too can become superheroes! Gary Shipman, animator for the hit movie, How To Train Your Dragon, will also be available. Special guests to Chicago Comic Con also include Bruce Campbell (Evil Dead, Army of Darkness), Patrick Stewart (Star Trek, X-Men, American Dad), other celebrities and many artists and writers including Eisner Award winners and nominees. Come celebrate the 30th anniversary of Evil Dead with the cast reunion. Aspiring artists can have their portfolios reviewed by David Campiti, who has helped launch many careers at Marvel and DC. And don’t forget to get “simpsonized” by multi-award-winning Simpsons animator, Phil Ortiz. For more information on Kid's Day, please visit http://www.wizardworldkids.com/. 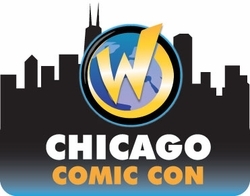 For more information about Chicago Comic Con, please visit http://www.wizardworld.com/home-ch.html. Thursday, August 11, 2011 - 5:00 p.m. - 9:00 p.m.
Friday, August 12, 2011 - Noon - 8:00 p.m.
Saturday, August 13, 2011 - 10:00 a.m. - 7:00 p.m.
Sunday, August 14, 2011 - 10:00 a.m. - 5:00 p.m.